Tell people you’re serving sugar cream pie in these parts and you’ll soon gather a hungry crowd! You better make sure you have enough s o you’d better make two! 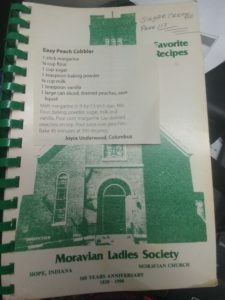 This sugar cream pie recipe comes with a check mark next to the name and came be found in the Indiana’s Moravian Ladies Society’s Favorite Recipes book from Hope, Indiana. This edition celebrated 160 years of the Society and is from 1990. Cook until think at low heat. Pour into baked crust and sprinkle top with nutmeg. 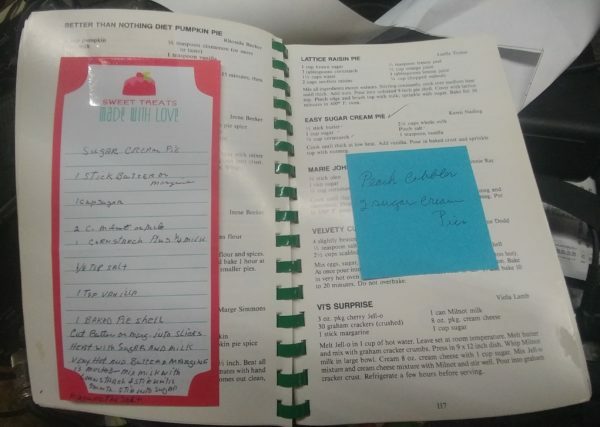 ← Persimmon Pudding – Very Good!